With eleven years as an Edinburgh Festival must-see phenomenon, a critically acclaimed West End run and an Olivier Award to their name, The Showstoppers have blazed a trail in world class improvised comedy and delighted audiences across the globe. Now, as they approach their 1000th performance, this incredible show returns to The Other Palace for eight weeks of singular, one-night-only musical extravaganzas. Every Showstopper! 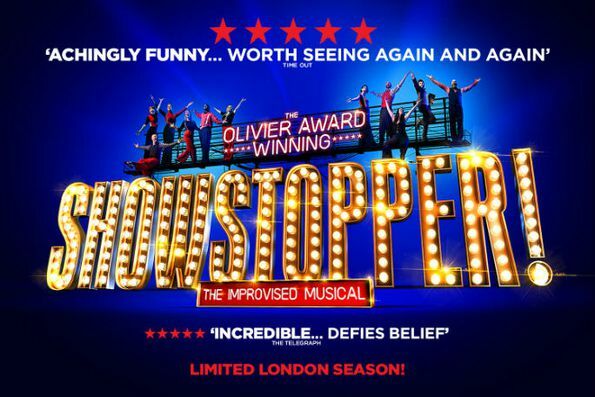 performance is a brand-new musical West End hit waiting to happen – so don’t miss out! Showstopper! The Improvised Musical is not available to book, please sign up to our newsletter for updates and offers on forthcoming and available shows.